Ortsion Bartana was born in 1949 in Tel Aviv, and still lives in his native city. 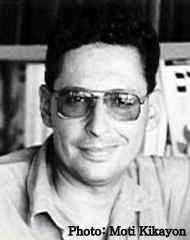 He received his MA in literature and philosophy from Tel Aviv University and his PhD in Hebrew literature from Bar Ilan University. He is now professor of Hebrew literature at the Ariel University Center. Bartana has served as chairman of the Hebrew Writers Association and editor of Moznayim, the association's journal, and as president of PEN Israel. He has received several awards, among them the Wollenrod Prize (1982), the Kugel Prize (1993), the Bernstein Prize for Literary Studies (1985; 1993) and the Brenner Prize for Poetry (1997).